Freeman is committed to excellence in serving all customers including people with disabilities. The following applies to all Freeman Branches across Ontario as well as any employee working in Ontario. We will strive at all times to provide our services in a way that respects the dignity and independence of people with disabilities. We are also committed to giving people with disabilities the same opportunity to access our services and allowing them to benefit from the same services, in the same place and in a similar way as other customers. We will communicate with people with disabilities in ways that take into account their disability. We will not make any assumptions of the individual’s disability without notice from the customer. We are committed to welcoming people with disabilities who are accompanied by a service animal or support person on the parts of our premises that are open to the public. At no time will a person with a disability who is accompanied be prevented from having access to his or her support person or service animal while on our premises. If we cannot easily identify that the animal is a service animal, we will ask the person to provide documentation from a regulated health professional that confirms the person needs the service animal for reasons relating to their disability. We will respect that service animals are not pets and shall not be communicated with or touched. In certain cases, we may require a person with a disability be accompanied by a support person for health and safety reasons. Before making a decision, we will consult with the person with a disability to understand their needs, consider health or safety reasons based on available evidence and determine if there is no other reasonable way to protect the health or safety of the person or others on the premises. We will provide reasonable notice, when our facilities or services that people with disabilities rely on to access or use our services are temporarily disrupted. Freeman will provide training to all employees or all others who deal with the public on their behalf. Customers who wish to provide feedback on the way Freeman provides its services to people with disabilities can do so by emailing Lesley Dolan at lesley.dolan@freeman.com. All feedback will be directed to Donovan Watson, Controller. Complaints will be addressed according to our regular complaint management procedures. Any policy of Freeman that does not respect and promote the dignity and independence of people with disabilities will be modified or removed. Freeman Expositions, Ltd (“Freeman”) is committed to meeting the accessibility needs of people with disabilities in a timely manner. Freeman has established an accessibility policy and a multi-year accessibility plan to meet its obligations under Regulation 191/11, “Integrated Accessibility Standards” (“Regulation”) under the Accessibility for Ontarians with Disabilities Act, 2005. The Freeman vision for accessibility is that people with disabilities, visible or invisible, are given the same opportunity as others to obtain and benefit from services offered by Freeman. Freeman’s goal is to make reasonable efforts to provide services in such a way that the key principles of independence, dignity, integration and equality of opportunity for persons with disabilities are respected. This policy applies to all employees, volunteers and agents of Freeman who interact with Freeman’s current and prospective employees, volunteers, agents, customers, clients, suppliers, and any other users of Freeman’s services. 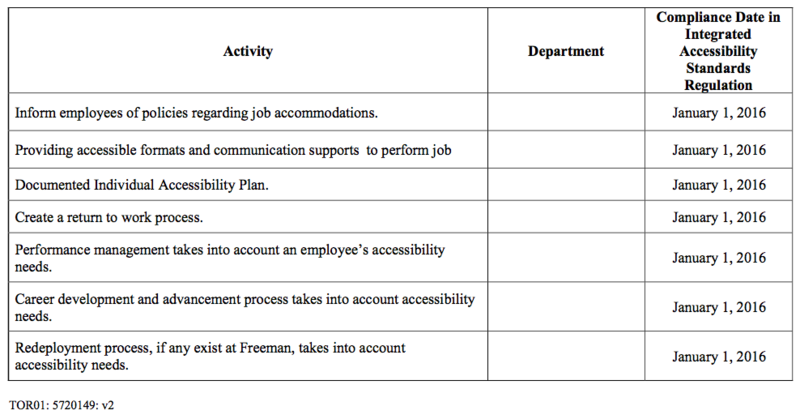 Freeman’s Multi-Year Accessibility Plan outlines a phased-in strategy to prevent and remove barriers and meet its requirements under the Regulation. Freeman will post the plan on its website and will provide it in an accessible format upon request. The plan will be reviewed and updated at least once every five years. 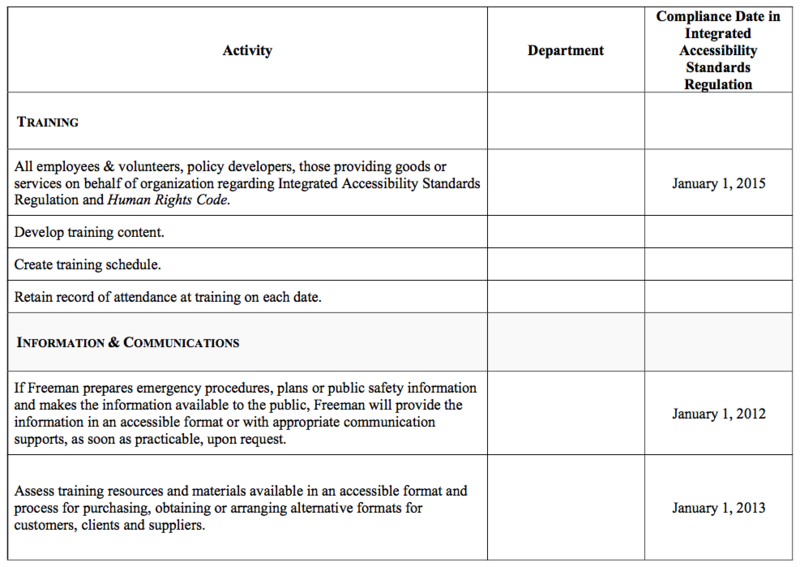 By January 1, 2015, Freeman will ensure that training is provided to all employees, and volunteers, and all persons who participate in developing Freeman’s polices, on the requirements of the accessibility standards referred to in the Regulation and on the Human Rights Code as it pertains to persons with disabilities. Training will be provided as soon as practicable. If any changes are made to this policy or the requirements, training will be provided to include those changes. Freeman shall maintain a record of the dates when training was provided and the number of individuals to whom it was provided. Freeman shall ensure that others that provide goods, services or facilities on behalf of the organization have had training. 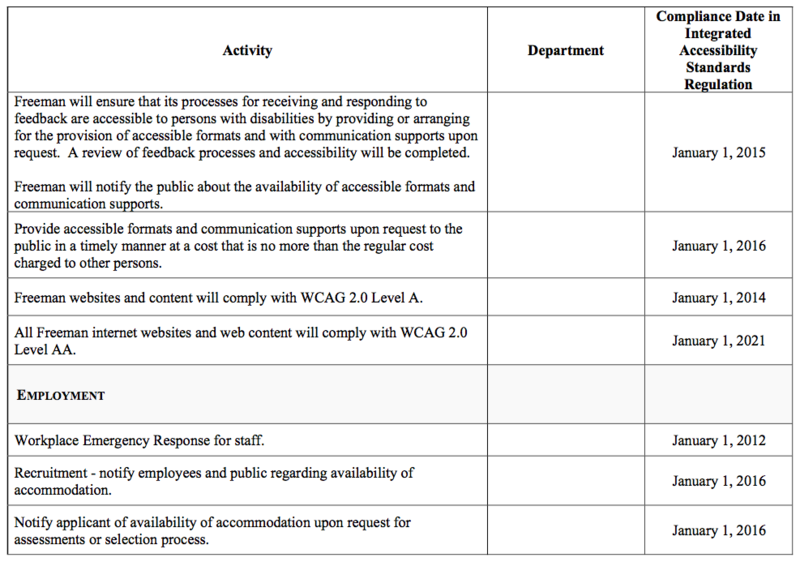 By January 1, 2015, Freeman will ensure that its processes for receiving and responding to feedback are accessible to persons with disabilities by providing or arranging for the provision of accessible formats and with communication supports upon request. Freeman will notify the public about the availability of accessible formats and communication supports. (b) the technology to convert the information or communications is not readily available. Where practicable, by January 1, 2014, Freeman will make any new internet website and web content on those sites conform with the World Wide Web Consortium Web Content Accessibility Guidelines (WCAG) 2.0 initially at Level A and increasing to Level AA. By January 1, 2021 all internet website and web content backdated to 2012 will conform with WCAG 2.0 Level AA. 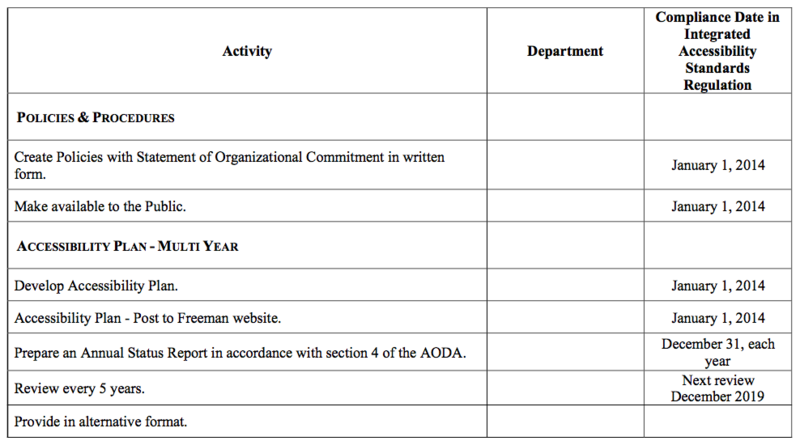 Freeman will comply with the requirements of the Employment Standards in the Regulation by January 1, 2016. The Employment Standards apply in respect of employees, and not volunteers or other non-paid individuals. When making offers of employment to a successful applicant. accessibility needs due to a disability. Freeman will consult with the employee making the request in determining the suitability of an accessible format or communication support. Freeman will have in place a return to work process for employees who have been absent from work due to a disability and require disability-related accommodation in order to return to work. Such processes shall be documented and must outline the steps that Freeman will take to facilitate the return to work and include an individual accommodation plan. Redeploying employees in lieu of a layoff. Review the individualized workplace emergency response information when the employee moves to a different location in the organization, when overall accommodations needs or plans are reviewed and when Freeman reviews its general emergency response policies.